I just found out at 5am that the Tournament ending early Sunday night at 11pm. Is this true? So, I am leading all event. I take a break thinking that I have 15 hours left. However, those in the huge guild consortiums get advance notice that it is ending early, so they make a rush for the top. I see them rushing, but I don't care becuase I have 15 hours right? If this is true, please refund all my money for the event and cancel my 4 accounts. So, the event banner shows event ending on Monday at 3pm central. The forum states all significant recording of event progress ends at 11 pm central on Sunday. As a result, players who do not obsessively follow forum posts take it in the shorts. 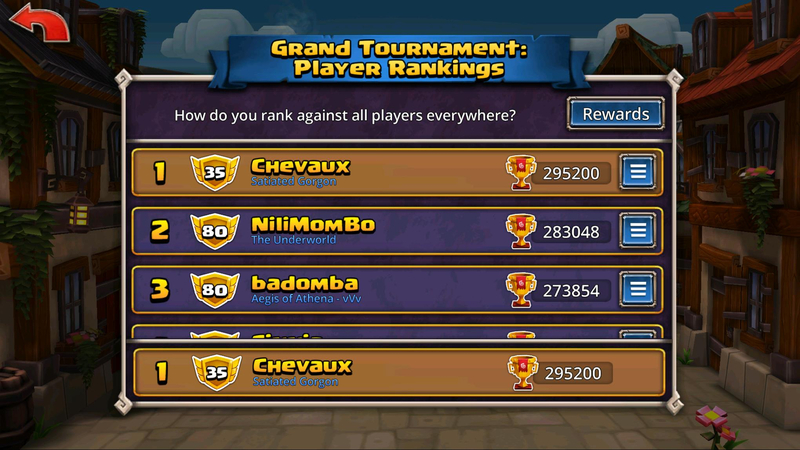 Well played on the part of the top guilds. Do not expect compensation for this as "the plans were on display". I feel for you, man. At 11 PM last night, we took a snapshot of the current leaderboards. We will adjust the reward thresholds to account for overnight activity today. The end result will be, in general, that your place on the leaderboard last night at 11pm will determine your rewards at tournament end. any modifications to placement groupings will lean toward the generous side - a good example being that rewards for 6-10th place will likely be extended to 6th to 11th place. First and second place will be handled separately if need be, but expect that rewards at tourney end match the standings at 11pm last night, as advertised. That sounds fair and appropriate. As advertised? Where? The game says it ends in a few hours! How is that fair and appropriate? Did you send a global announcement in DB that it would end early? Then it would be fair and appropriate! Fine...anyone want my accounts? [email protected] password asdf54321, [email protected] password asdf54321, [email protected] password asdf54321. I quit. Leading all event? I never saw you leading. Really, so I just snuck in at the last second and got almost 300k in an hour? ****, I'm good! You may have been in the top ten, but that’s much different than leading. Every time I looked, the leader was Severina, Nilimombo, or Cinnia. I never ever saw your name until this morning. LOL You didn't sneak in at the last minute John. I stopped for a reason. Maybe your GM should have communicated that with you last night. I watched all of you take off. I had no idea that it was ending early. So, I just thought it was a random push. 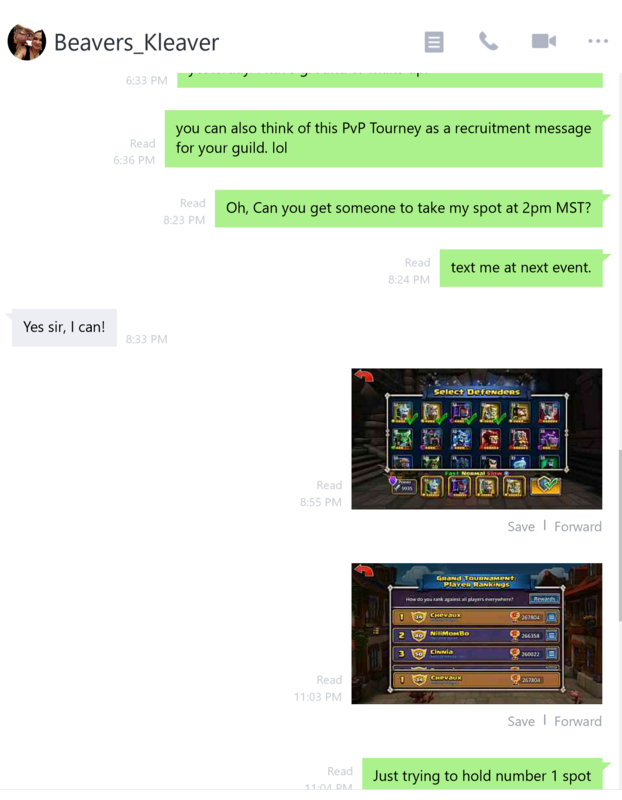 I just joined a random guild to play the tournament. in this weekend as well. To ask players to continue that for another day was completely unfair as most of us scheduled our time for this to end last night. Not everyone checks the forums, and the ingame timer says today @ reset time. This should have been communicated in-game, THEN on the forum. Yes, I know your GM knew, and I would think you know big events like this require coordination. 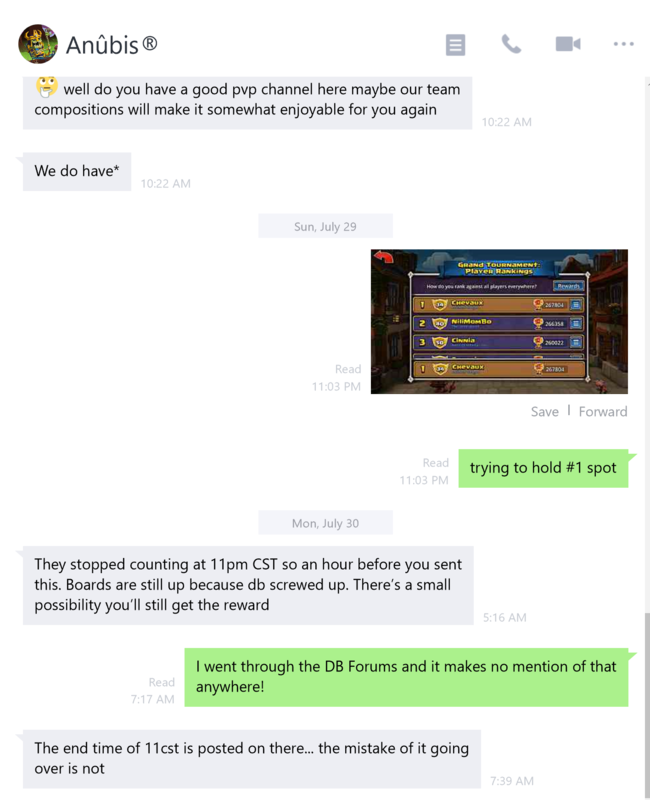 Sorry you just did your own thing and didn't check in with your guild and GM, especially when it became obvious why you were climbing... because everyone else stopped. Maybe if you didn’t hop through every top guild in the game, someone might have told you. THIS is when I found out. Well, It is time for me to leave. Good Luck to all the players out there! Please enjoy the game. May I respectfully suggest that DB refrain from ending an event well before the advertised in-game ending time? May I also suggest that such a situation, when it does occur, be handled with more concern? I can certainly understand why people who spent money with a certain expectation may feel slighted, and I also am concerned that ambiguous event ending times may cause unnecessary confusion in the future. If any situation called for the use of in-game announcements, more communication, and perhaps even compensation, it would seem this would be one of them. Again, I, personally, am not the least bit upset, but I am rather surprised at the way this was handled from a public relations perspective. Weather's beautiful, I'm going to go eat lunch. In all fairness, the devs were in a bit of a tight spot. No one brought it up until Sunday, so they didn't have much time, on their day off, so they had to think of a quick solution. 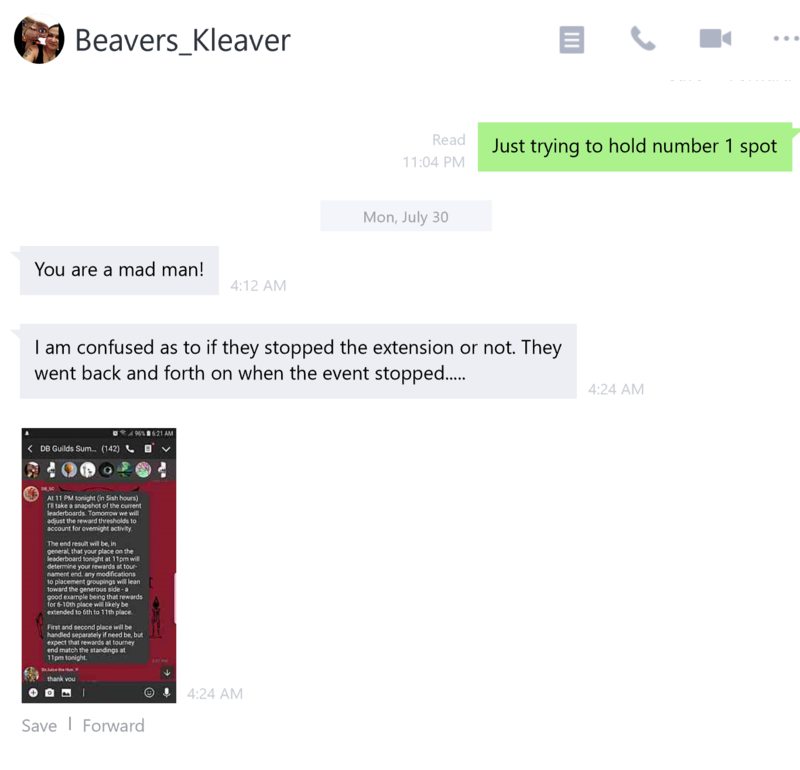 On one hand, they had a bunch of POed GM and officers in the summit chat talking about how awful this was because they had been told for weeks that it was ending at 11PM, like it always does, so they could have time to shift rosters around, and on the other, they had everyone who wasn't in a top-guild thinking they had an extra 17 hours. I think for the situation they were in, they made a pretty good solution that people seemed happy with. If you are to take anything from my ramblings away, remember that it was a Sunday and they had to try your best. Yeah...Some people aren't on LINE or the forum 24 hours a day. A simple message via in-game would have been the best. John literally only joined to do the event and he killed it. I can see why he is ticked off. He dropped a bunch of money. Hey folks, just a heads up that we're still going to be going with the plan that DB_SC outlined, but that the few guilds in the rankings that have rewards being changed will still get the original payout in the mail shortly. We will be sending out the difference by hand, which should get to you by Wednesday at the latest, but hopefully by tomorrow. Apologies for the communications lapse, things happening on a Sunday threw us for a bit of a loop. How long did those matches take you at level 35? 10 seconds max. I'm sure everyone else in top 10 put more time and effort in than you did. @lythander pretty sure it doesn't matter. He put the time and effort in. Not his fault that those higher accounts have crappy runes, competition, or stars that can't make PvP easier. He put the money and time in to it. Just like all those other people, give me a break. All those matches he played takes time, just like everyone else.